* This may be one of the strangest things you will ever see on a basketball court. A coach in France tries to strip the ball away from an opposing player in the dying seconds of a tied game. And after receiving a tech, he actually protests his innocence. That’s a new one. 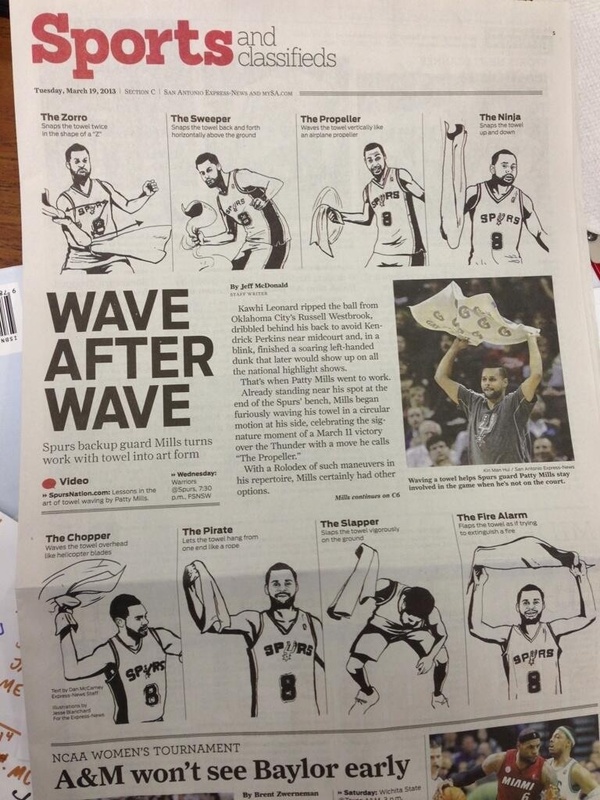 * Patty Mills’ towel moves show up in a San Antonio newspaper. * This is hilarious. A Phoenix Suns fan is caught on camera nodding off during a game. I don’t blame him. * Warriors beat man Marcus Thompson II from the Contra Costa Times says Andrew Bogut is living up to the hype. * I highlight all his good stuff so it’s only fair I cover the other side – here’s Bogut going for a monster statue of liberty dunk only to be denied by the great man, Timmy D.
* Some amazing footage of Wilt Chamberlain. * Robert Sacre has a Snoop Dogg tattoo on his torso. * The NBA is getting lax on the flopping rule. * A couple of big throw downs from Michael Beasley and Paul George. * I’ve been bangin’ on about this for a while – the absurdity of the NBA regular season schedule – and now Henry Abbott from TrueHoop weighs in on the issue with this terrific piece. * Two game-winning tips by Marc Gasol and Anthony Davis. * Marc Gasol plays crazy defense with his shoe. * A fan picks his nose and then winks to the camera. * In case you missed it here’s footage of the fan in Cleveland – wearing a “We Miss You, LeBron” t-shirt – running onto the court during the Cavs vs. Heat game.